FUNNY GIRL - ONE NIGHT ONLY! 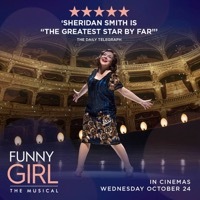 Following its record-breaking, sell-out run in London’s West End and national tour, the critically-acclaimed musical Funny Girl comes to a cinema near you, featuring Sheridan Smith in “an unforgettable star turn” (The Times). Funny Girl is semi-biographical, based on the life and career of Broadway star, film actress and comedienne Fanny Brice (a role made famous by Barbara Streisand on Broadway and in the 1968 film adaptation), and her stormy relationship with entrepreneur and gambler Nick Arnstein.